Credit: Collection Gert Koshofer, Bergisch Gladbach (Germany). Zoechrome samples from the Kodak Film Samples Collection at the National Science and Media Museum in Bradford. Credit: National Science and Media Museum Bradford. Photographs by Barbara Flueckiger in collaboration with Noemi Daugaard, SNSF project Film Colors. Technologies, Cultures, Institutions. Zoechrome samples from the Kodak Film Samples Collection at the National Science and Media Museum in Bradford. Credit: National Science and Media Museum Bradford. Photographs by Barbara Flueckiger in collaboration with Noemi Daugaard. 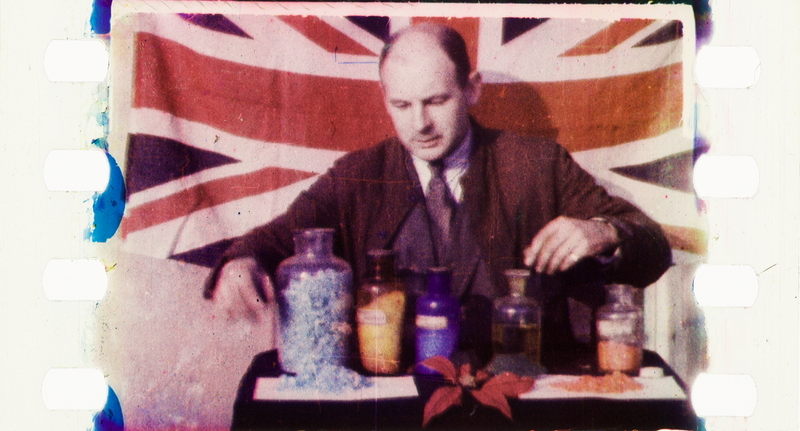 “An English company, Zoechrome, whose film has not yet been seen in public, has attacked this problem in a most ingenious way, and has, moreover, succeeded in achieving something on which Technicolor are still working; that is, putting three colours on the same side of the film. A camera is used having four lenses cemented in a group (three quite small, and one ordinary size) which photograph four different images of the same aspect at once. The three small lenses have behind them the three necessary colour screens, red, green, and violet-blue, which photograph their respective colour factors simultaneously, but not overlapping on to the space of the one ordinary sized picture. 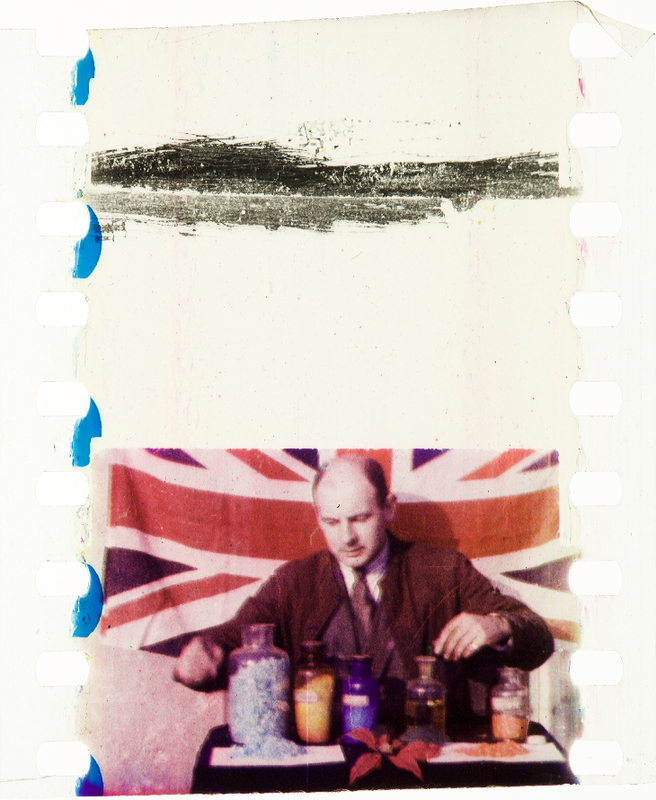 Each colour screen picture is one quarter the size of an ordinary film picture. The fourth lens gets over the trouble mentioned previously, of lack of definition, by photographing an ordinary black and white picture which acts, as it were, as an optical key on which to superimpose the colour images. The fact that four lenses are used instead of one, and that a very ingenious modification has been made to the shutter, makes it possible to do away with the extra lighting usually associated with colour work. The camera can be turned at the speed and under the same lighting conditions as an ordinary cinecamera – a tremendous advantage over other methods. 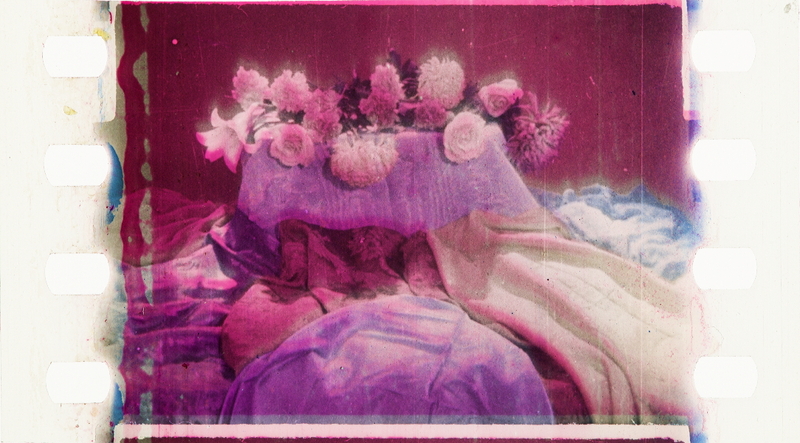 The illustration shows a Zoechrome negative. 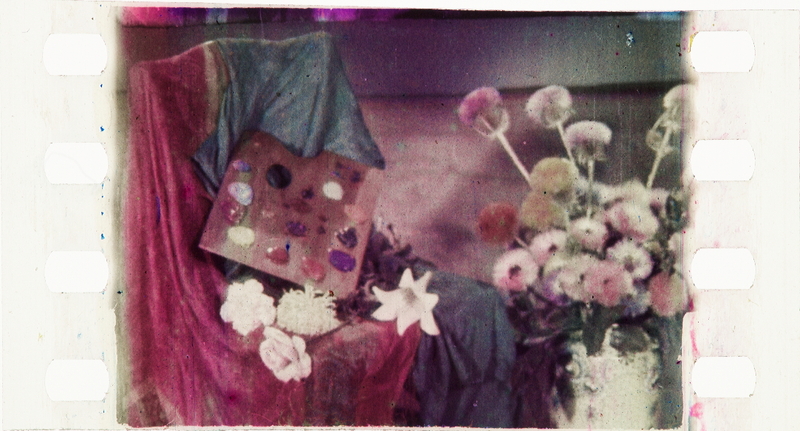 The coloured positive, of course, in a black and white illustration, would be no different from an ordinary black and white film. 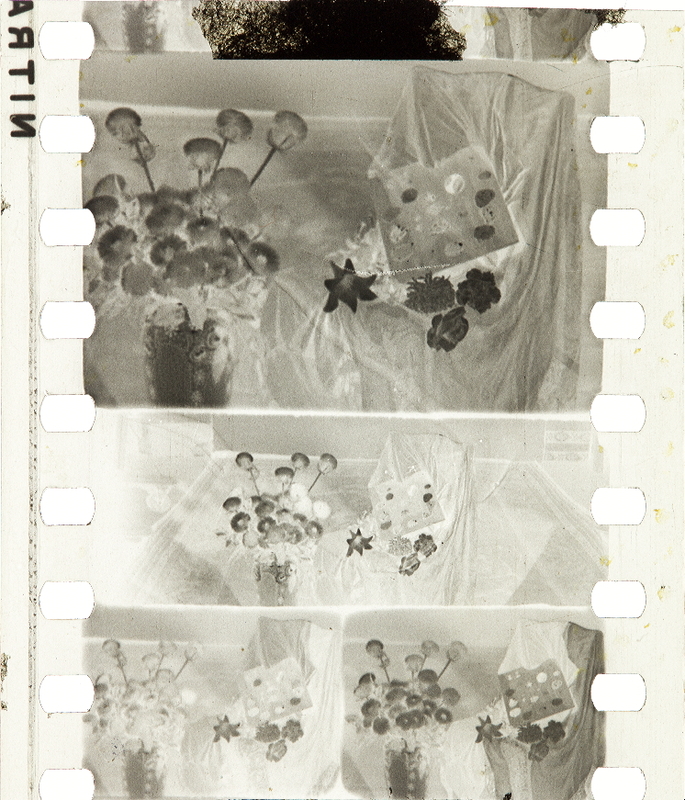 The negative is developed in the usual way, fixed and dried. 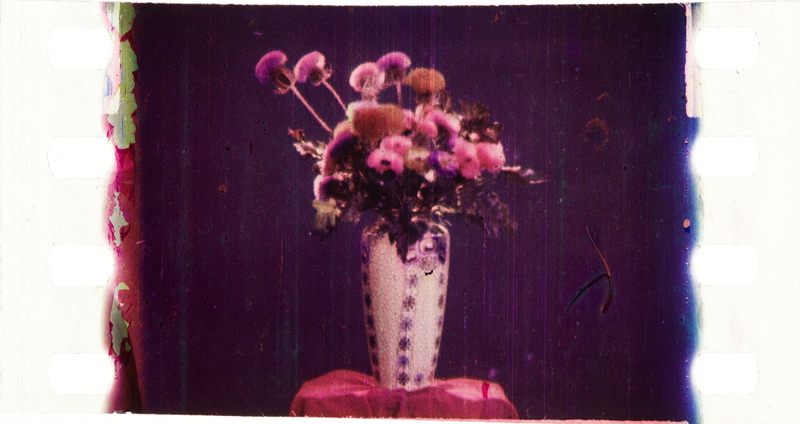 In printing Zoechrome have again departed radically from ordinary procedure. A projection printer is used, which projects the images from the negative on to the positive, which is in another mechanism, much as an ordinary enlarger treats a snapshot, or a magic lantern throws a slide on to a screen. The black and white key picture of normal size is printed first, the negative mechanism pulling down two picture spaces to the positive mechanism’s one. The black and white length is then developed to a half-tone depth, that is to say, to form a grey and white picture, with no real black, but only varying shades of grey. It is then fixed, washed, dried, and varnished. 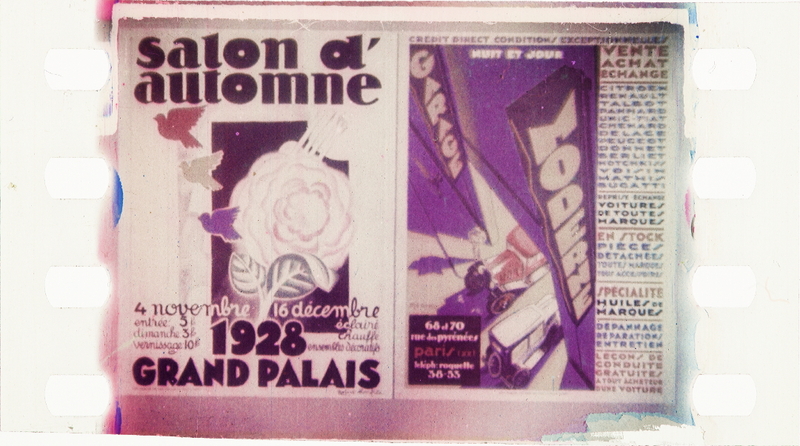 The same film is then recoated with fresh light-sensitive emulsion on top of the grey image, and the first colour-sensation negative is enlarged from quarter size to full size, and perfectly superimposed on the top of the half-tone pictures along the whole length. 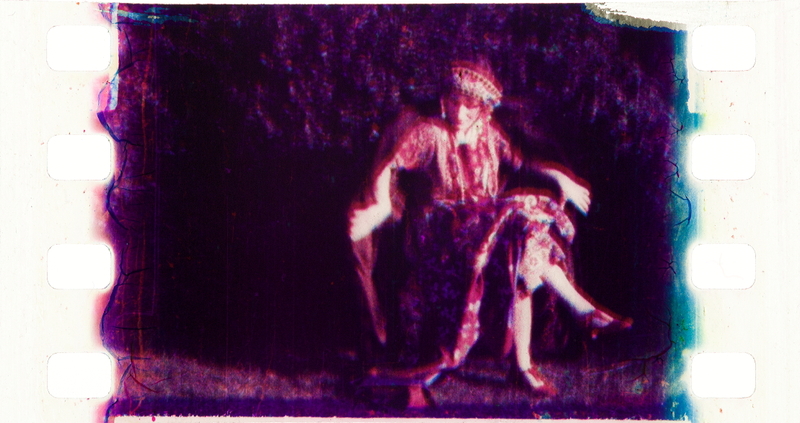 This is then developed, fixed, washed, and toned the complementary colour to the screen through which it was photographed. Thus the negative taken through a red screen produces a positive in varying intensitives of blue-green. The negative of the violet-blue component gives a yellow positive, and that of the green component a magenta positive. It will be seen from the above that each toning colour contains the spectrum minus the colour of the photographing filter. When the first colour positive has been toned with what is known as a basic dye, as distinct from an aniline dye, the dye is mordanted or fixed, and the silver image is then dissolved out, leaving only the dye behind, which is absolutely transparent. 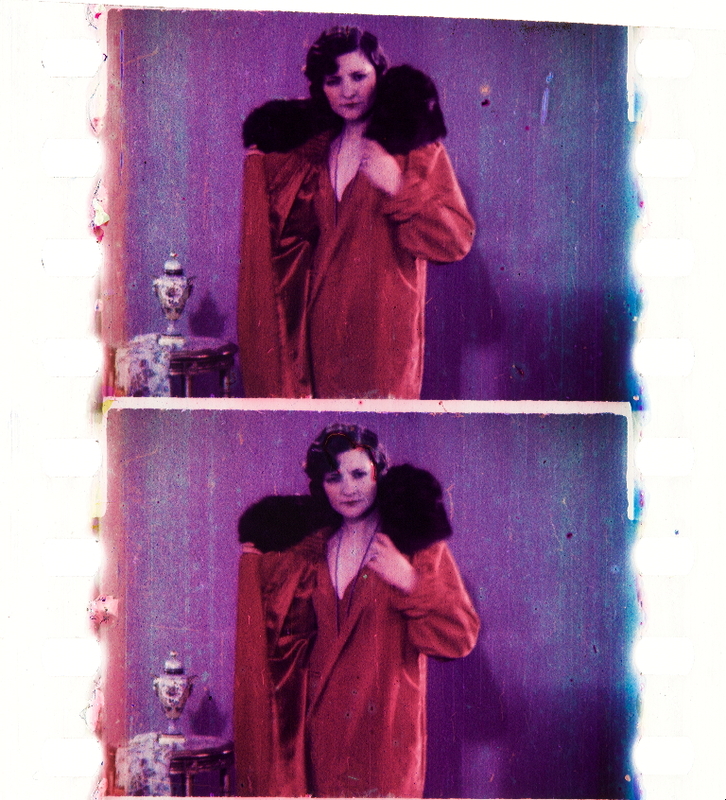 A second coat of varnish is applied when the film is dry, and a further coat of emulsion applied to receive the second colour; and after this has gone through the same process, yet a third emulsion is applied on which the third colour component is printed in its complementary tone. All this sounds very complicated, but actually it is automatic throughout, and the final result is no thicker than an ordinary black and white positive, whereas it has everything on one side of the film. It needs no extra strength of light to project it, because all the colours are absolutely transparent, being only dyes and not part of the detail or definition of the picture. All the detail and definition of the picture is contained in the half-tone key; so that the colours are only asked to do their normal job, i.e. to colour the parts which should be coloured. Imagine it. Four separate emulsions, four separate printings and developings, and three layers of varnish so thin that the finished film is no thicker than an ordinary single-emulsion film. 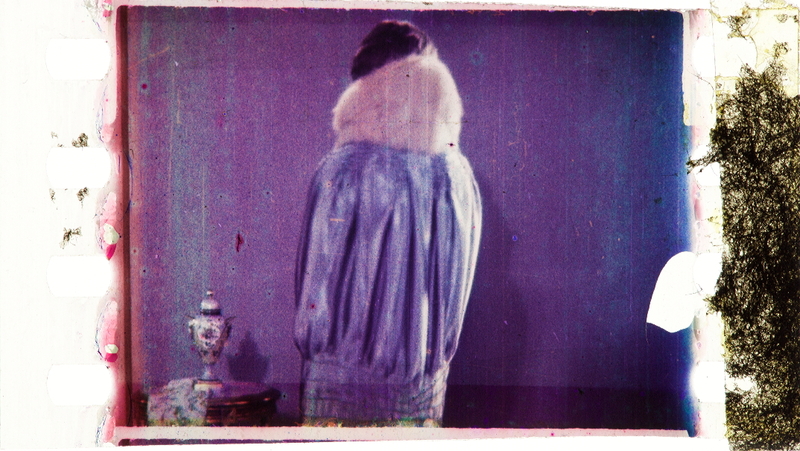 Zoechrome was developed by Thomas Albert Mills over an extended period. 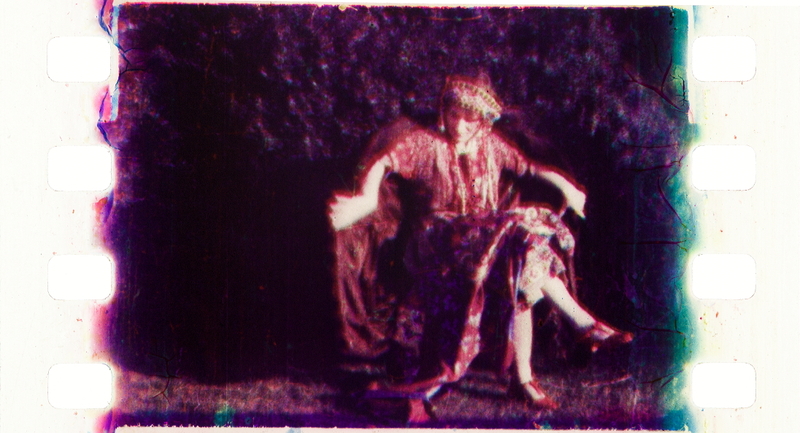 He first patented a successive-frame system for two- or three-colour cinematography in December 1911. 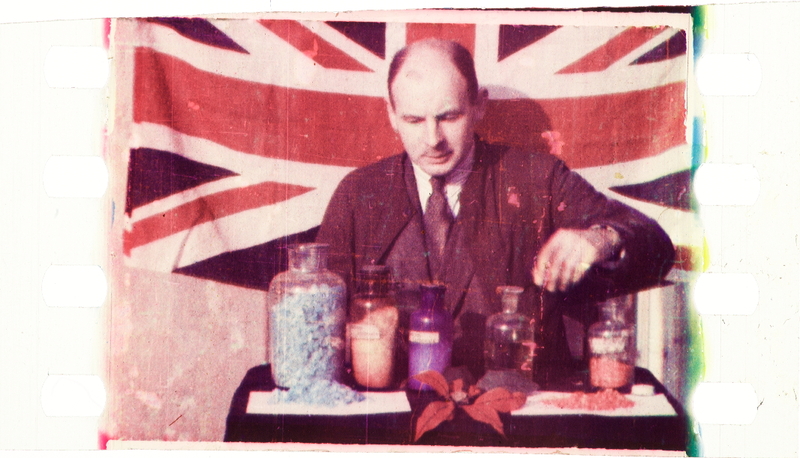 This was a complicated system in which, for two-colour, successive images were captured through blue and orange filters. 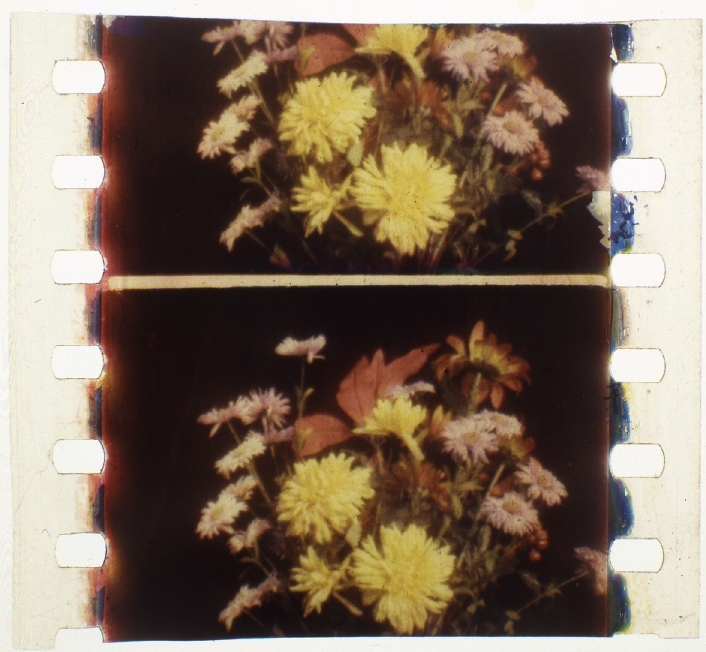 After printing the successive frames were toned blue and orange and then the film was coated with emulsion on the back and the same images printed one frame out of register and toned identically, so behind each blue-toned frame on the print was an orange-toned frame. Zoechrome Ltd was registered in February 1912 with a nominal capital of £15,000 in £1 shares to acquire the rights Mill’s patents. From 1921 the process was significantly revised and by the time it was first demonstrated in 1929 it used one large and three smaller lenses. Successive frames were registered, one through the large, normal-sized lens creating a full-frame picture, and the next through the three smaller lenses resulting in three small images registered on a normal-sized frame. 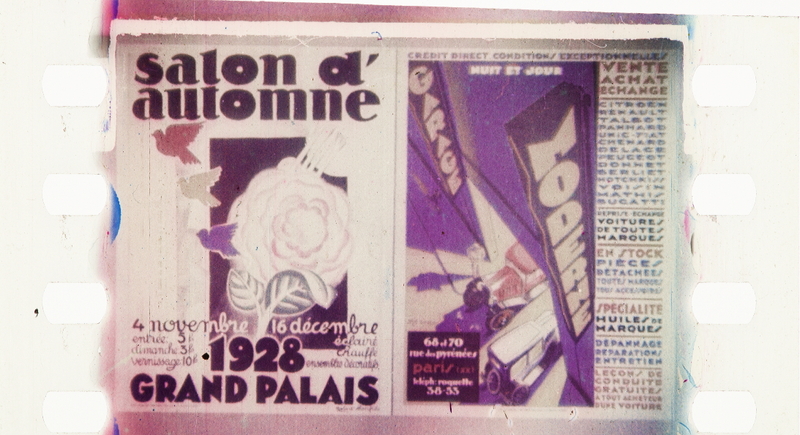 This created a negative which alternated between one full-sized frame and one frame with three smaller images. Each single frame image was printed to produce a black-and-white print of the full-frame image. This was then fixed with varnish and then recoated with emulsion. One of the three smaller images was then enlarged and printed over the full-frame image in register. The print was then dye-toned with the correct subtractive colour, and the process repeated with the other two colours. The function of the single, black-and-white full-frame image was effectively to override any parallax issues from the three smaller images, the larger one being much clearer and more dominant. 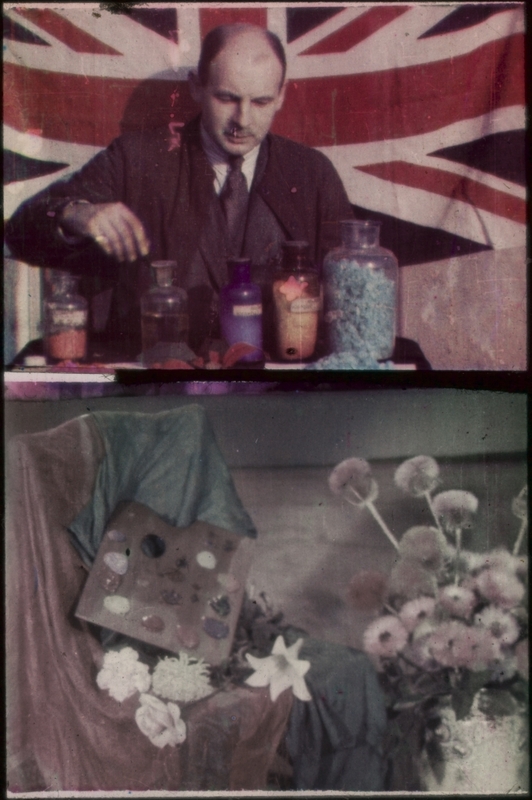 The first public demonstration of the process took place on 12 March 1929 at the New Gallery in London, featuring footage of the sea, country lanes and flowers. Despite a favourable review the following day in The Times, the company appears to have never traded and an official receiver was appointed in April 1931. When the process was offered for sale in 1932 there were no buyers and it ceased development. BT 31/32118/120350, Zoechrome Ltd, 1912, National Archives. Coe, Brian, The History of Movie Photography (London: Ash & Grant, 1981), pp. 130-1. Cornwell-Clyne, Adrian, Colour Cinematography (London: Chapman & Hall, 3rd edn, 1951), p. 536. Neale, Steve, Cinema and Technology: Image, Sound, Colour (London: BFI, 1985), p. 123. Wir besprechen zuerst die subtraktiven Methoden und beginnen mit den Zweifarbenverfahren. Die beiden typischen Farbstoffe, die letzten Endes die Farbwirkung hervorrufen, sind ein Orangerot (1) und ein Blaugrün (2). Durch diese beiden Komponenten, ist das Spektrum, grob gesprochen, in zwei Teile zerlegt. Reine rote bis gelbe Töne werden stets durch Farbstoff (1) wiedergegeben; dabei kann natürlich die Anfärbung vom satten Grundfarbstoff bis zum Weiß (unangefärbt) stattfinden. Das gleiche gilt für Farbstoff (2), der die Töne von Grün bis Blau vertritt. Schwarz wird durch räumliche Hintereinanderlagerung beider Farbstoffe (zwischen Lichtquelle und Schirm) gewonnen, denn der blaugrüne Teil des Spektrums wird zunächst durch (1) ausgelöscht und der rotgelbe Teil durch (2) verschluckt.1 Das weiße Licht wird also in 2 Portionen fortgenommen – daher die Bezeichnung “subtraktive Methode”. Die Grauleiter entsteht entsprechend durch Hintereinanderschaltung schwächerer (aber in Summa neutral wirkender) Anfärbungen von (1) und (2), und schließlich besteht die Möglichkeit, durch Kombination verschieden kräftiger Anfärbungen beider Farbstoffe eine relativ umfangreiche Reihe von Mischfarben (z.B. die Fleischfarbe) hervorzubringen. Das Problem besteht nun darin, diese beiden Farbstoffe jeweils in der richtigen Konzentration an die richtigen Stellen der beiden Teilbilder zu bringen, die durch Über- oder Hintereinanderlegung die Gesamtwirkung hervorrufen. Zur Herstellung der beiden Teilnegative bestehen hauptsächlich zwei Möglichkeiten: die Strahlenteilung und der Zweipack. Wie Abb. 1 an einer schematischen Darstellung des Strahlenteilungsprinzips unter Fortlassung der Linsenoptik zeigt, fällt das vom aufzunehmenden Objekt kommend Licht zunächst auf den halbdurchlässigen Spiegel S. Die eine Hälfte der Strahlung wird reflektiert und erzeugt auf dem (panchromatischen) Film p2 hinter dem Rotorange-Filter F2 ein Bild des Rotorange-Anteils, da das vorgestellte gleichgefärbte Filter die übrigen Lichtarten fortnimmt. Die andere Hälfte der Strahlung geht durch S hindurch und entwirft auf dem Film p1 den Blaugrün-Auszug, weil das eingeschaltete gleichfarbige Filter F1 den komplementären Teil des Spektrums absorbiert. Mit Hilfe der Perforation des Films lassen sich die zusammengehörigen Bilderpaare exakt zu konturgetreuer Deckung bringen, wenn durch die sonstigen optischen Bedingungen der Apparatur identische Abbildungen gesichert sind. Es besteht also auch die Möglichkeit, die auf den Einzelfilmen p1 und p2 erzeugten Bilder durch geeignete Hilfsmittel auf einem gemeinsamen Film untereianderstehend anzuordnen, wobei nach jeder Aufnahme die doppelte Filmlänge wie normal transportiert wird; solche Negative werden nicht im Kontakt, sondern optisch kopiert. – Abb. 2 zeigt die Trennung der Lichtarten nach dem Zweipackverfahren, bei dem die Aussonderung der beiden komplementären Lichtarten durch die verschiedene spektrale Empfindlichkeit der photographischen Schichten erfolgt. Ein blaugrünempfindlicher Frontfilm liegt bei der Aufnahme Schicht an Schicht und im engen Kontakt mit einem rotempfindlichen Schlußfilm. Das Licht tritt in den Zweipack durch das Zelluloid a des Frontfilms ein, gibt auf diesem den Blaugrün-Auszug, während das organgerote Licht auf die Schicht des Schlußfilms d wirkt, nachdem es durch ein mit dem Frontfilm verbundenes Orangefilter c von den Resten der Blaugrünstrahlung befreit wurde. Auch in dieser Anordnung wird durch die Perforation das exakte Aufeinanderpassen der beiden Bilder gewährleistet. Bemerkt sei noch, daß unter Einschaltung eines zweiten halbdurchlässigen Spiegels in die Strahlenteilungskamera oder eines Zwischenfilms beim Dreipack2 der Übergang zur Dreifarbenphotographie möglich ist, da auf diesem Wege (bei Anwendung entsprechender Filter) drei getrennte Farbauszüge herstellbar sind. Mit Hilfe der auf die eine oder andere Weise gewonnenen beiden Teilnegative ist nun im anschließenden Positivprozeß die Einführung der genannten beiden Farbstoffe zu bewerkstelligen. Dies kann nach zwei Verfahren geschehen. Entweder man stellt von den Negativen auf photographischem Wege oder mit Hilfe des Chromatprozesses Gelatinereliefs her, die man im komplementären Sinne anfärbt und im Absaugeverfahren auf einen Blankfilm mit Gelatineüberzug hintereinander und unter Innehaltung exakter Konturdeckung überträgt; der Orangerot-Auszug liefert also das blaugrün gefärbte Teilbild und umgekehrt, wobei schließlich beide Bilder auf der gleichen Schichtseite des Blankfilms übereinanderliegen. – Oder man kopiert (wie Abb. 2 zeigt) die beiden zusammengehörigen Teilnegative gleichzeitig auf einen zwischen ihnen liegenden doppelseitig begossenen Positivfilm, so daß die entsprechenden Kopien zunächst als Silberbilder auf getrennten Seiten liegen. Verwandelt man diese in Farbstoffbilder durch chemische Tonung (Eisenblau- oder Urantonung) oder durch Virage (z. B. Jodsilberbeizfärbung) wiederum im komplementären Sinne, so ergibt sich ein ebenfalls wie beim Absaugeverfahren, subtraktives Zweifarbenbild. Schließlich kann man auch die Negative oder zweckmäßiger die auf einem doppelseitig beschichteten Film einander gegenüber angeordneten Duplikatnegative in gebleichte Gerbreliefs überführen und zu den Aufnahmefiltern komplementär anfärben. Die nachfolgende Tabelle zeigt, in welcher Weise eine Anzahl bekannter Verfahren die genannten Methoden (in zum Teil etwas modifizierter Weise) kombinieren. 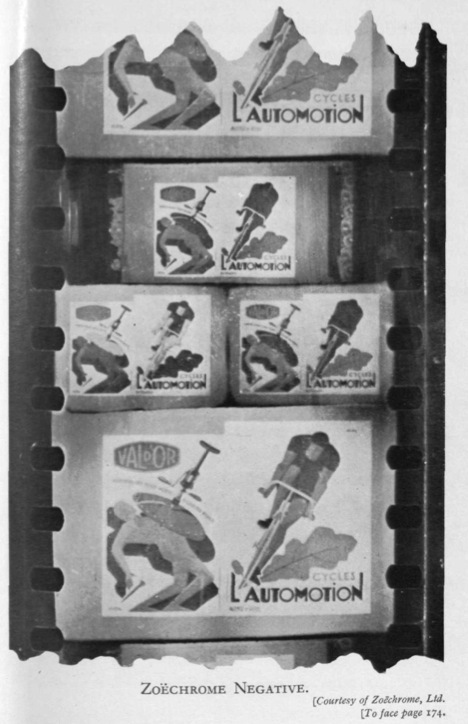 In der letzten Spalte der Tabelle wird auf die beiliegende Tafel verwiesen, für die die Firmen Technicolor Motion Picture Corp., Boston, Eastman Kodak Co., Rochester, Multicolor-Films-Inc., Los Angeles, Universum Film. A.-G., Berlin, und “Sirius” Farben-Film Ges.m.b.H., Berlin, einige Probebilder in dankenswerter Weise zur Verfügung gestellt haben. Dem Multicolor-Verfahren ähnlich sind das Magnacolor-, Polychromide-, Photocolor-, Colorcraft-, Coloratura- und andere Verfahren, die zum Teil die Strahlenteilung als Aufnahmemethode verwenden. Das Harriscolor-Verfahren bedient sich eines einschichtigen Positivfilms und erzeugt die einzelnen Teilbilder in verschiedenen Schichttiefen. Das Foxcolor-Verfahren ist dem Kodachromverfahren analog. Bei dem Zoechrom-Verfahren werden die den einzelnen Teilnegativen entsprechenden Teilbilder auf nacheinander aufgebrachte Schichten nacheinander kopiert, entwickelt und gefärbt. 1 Bei gewisser Farbstoffauswahl bleibt übrigens gelegentlich an Stelle von Schwarz ein Lichtrest in der Tönung von dunkler Sepia zurück.